Expert angler and outdoorsman Captain Chris Dollar brings up-to-date insight to the Bay Bulletin. Check in weekly to see what’s happening out there right now. When it comes to migratory fish, it’s better late than never, I always say. In this case, I speak of cobia, which a day or so after last week’s report, finally swam into Maryland waters. Captain Mike at Buzz’s Marina at the mouth of the Potomac River reports several have been caught including three by the group fishing with Kyle Johnson of Rock Solid Charters. Reminder: Maryland has a 40-inch minimum size on these ling-fish also known as “Mr. Brown Suit”, and you can keep just one cobia per day, or three fish total per vessel, regardless of the number of anglers on board. In the upper Bay, it’s almost a carbon copy of last week’s report. Most of the action has been above the Bay Bridges, and most anglers are chumming and catching limits. If this were the late 1990s and we were talking baseball, I might say the rock were on “the juice.” Meaning these fish are now fully attuned to the flow of free bunker bits. You could choose to strike out (pun) on your own, away from the crowd, and try the Chester, Choptank or Eastern Bay. The morning bite has been best, but it is usually brief. Breaking fish are a thing, just not a regular thing. The upper Corsica had rock to 19 inches hitting Smack-it Jrs. just the other day. There is plenty of bait all around the Bay. Some nice channel cats are being caught on live-bottom lumps such as Belvedere and Nine-foot shoals. Crabbing is better in some rivers, still down in others. Crabbing has not been great so far this year. It’s been an odd year for bottom fishing above the Patuxent River, if you ask me. Spot are scarce, but just now, Captain Harry Nield of Kingfish II reported that some big spot have just arrived in Tangier Sound, and they go best for cut bloodworms. The croaker fishing in the Bay remains slow, but there are some good-sized blues around. 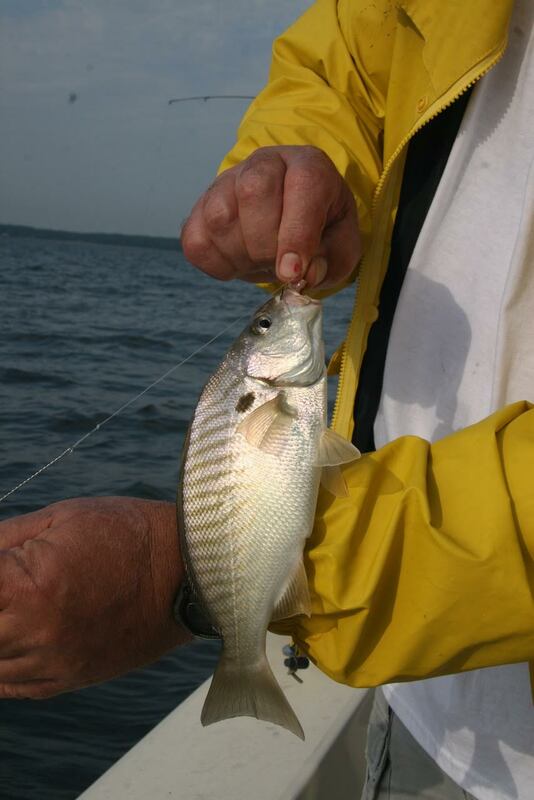 Try the CCA-Tilghman Island Reef, the Stone Rock and points south, perhaps mixed in with the small stripers. The white perch are finally starting to act right. Fish the tributaries around the docks and in the salt ponds. In the OC Tuna Tournament, the sport fishing boat Playmate scored a 66-inch, 144-pound bluefin tuna to take the top spot and more than $328,000. Winning the Heaviest Stringer category was Goin' In Deep with 325 pounds of fish, earning the team $237K. Fishing was great this weekend for anglers in the Virginia Beach Invitational Marlin Tournament. The fleet caught 18 whites, five blues marlin and plenty of fish for the grill, including a 52.30-pound wahoo on Reelin' N Dealin’ and 28.40-pound dolphin on Contango.